The ancient Greek Hippocrates, the father of modern medicine, famously said: “Let food be your medicine.” For most of human history, categorizing an edible item as either food or medicine could prove difficult or impossible (Totelin 2015). Even in the current era of modern pharmaceuticals, food and medicine exist along a continuum (Johns 1996; Etkin 2006; Valussi & Scirè 2012; Leonti 2012; Totelin 2015). The traditional Andean food Maca (Lepidium meyenii; family Brassicaceae) can be placed squarely in the middle of that continuum. Herbal medicine markets outside of its native Peru have recently discovered maca and loudly and lucratively promote an aspect of maca’s medicinal reputation that has particular relevance on Valentine’s Day: an aphrodisiac that increases stamina and fertility (Balick & Lee 2002; Wang et al. 2007). Peruvians have always viewed maca as having multiple health benefits (Balick & Lee 2002; Wang et al. 2007), but maca is one of the few calorie-rich crops that grow at 4000 meters above sea level, making it an important dietary staple in the high Andes. Even so, even in ancient Incan societies, maca wasn’t just an average bowl of porridge. Inca warriors ate maca to increase their energy and vitality before battle but were prohibited from consuming it after a city conquest to protect the women of the city from, well, let’s say the warriors’ overenthusiasm (Wang et al. 2007). Botanically, maca resembles fellow cruciferous vegetables (members of plant family Brassicaceae) radish (Raphanus sativus) and turnip (Brassica rapa). It has a small rosette of curly green leaves atop a starchy underground storage structure (technically the hypocotyl, a stem fused to a taproot, swollen with stored starches). Other cruciferous vegetables bearing starchy underground storage structures include rutabaga (Brassica napus), horseradish (Armoracia rusticana), and wasabi (Wasabia japonica). The kohlrabi (Brassica oleracea) bulb is a swollen aboveground stem base, so it’s structurally close. Traditionally, maca is eaten fresh, boiled or roasted, much like a turnip or a rutabaga, or dried and boiled later. It comes to northern health food stores as a dried powder. In an act of investigative journalism, I purchased and consumed this maca-laden chocolate. I couldn’t tell that it did anything to me other than confirm my supposition, which I had previously formed after eating chocolate-covered kale chips, that cruciferous vegetables and chocolate do not belong together. I love chocolate and cruciferous veggies, but not like this. 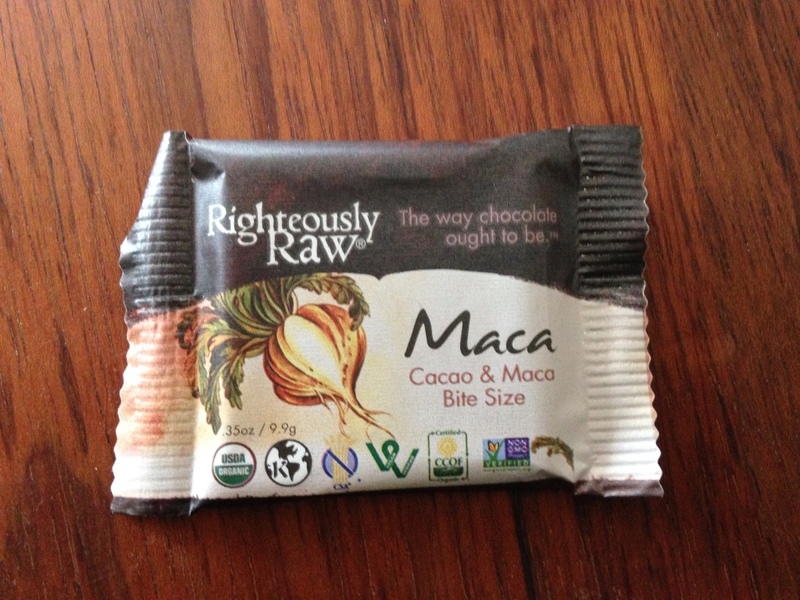 This maca chocolate did benefit my romantic relationship, though, in the sense that my husband laughed at me and at the assertion on this wrapper that this is “the way chocolate ought to be,” and laughter is good for a relationship. I was curious about how nutritionally special maca really is relative to its cruciferous (mustard family species) brethren with underground storage structures. Is it more than just an alpine turnip? Are superfood-conscious consumers in the U.S. and Europe paying exorbitant amounts for what amounts to dried and ground mountain radish? 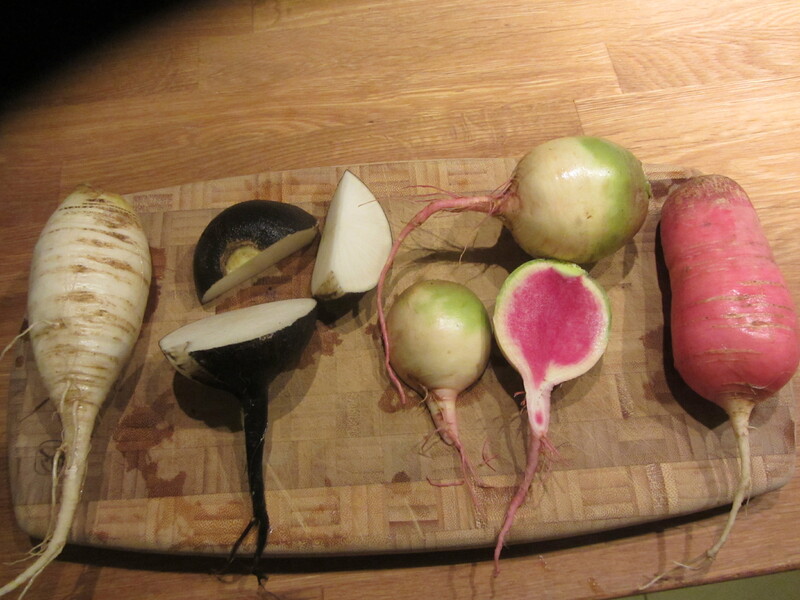 In asking this I in no way diminish the nutritional or flavorful quality of turnips and radish. 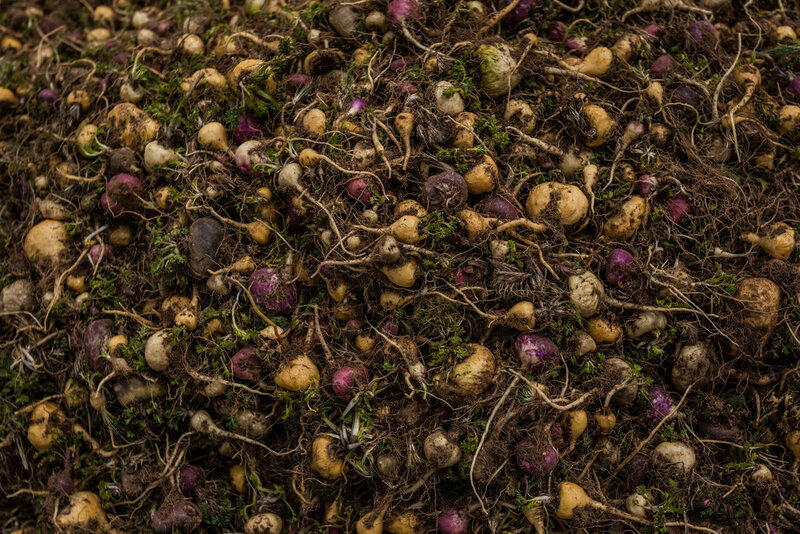 I adore turnips and radishes, but there’s hardly a lucrative market for powdered versions of them, and turnip farmers aren’t stealing each other’s crops in the dead of night to sell to Chinese businessmen showing up with suitcases full of money. So why maca? Turnips, rutabagas and radishes don’t have a reputation for making warriors feel extra amorous, unless there’s an ethnobotanical literature on that from Europe or Asia, birthplaces of turnips, rutabagas and radishes, of which I’m unaware. For purposes of academic rigor, I did spend a bit of time on Google Scholar looking into it, though I was a bit reluctant to do so because I was afraid such knowledge will sully my view of some beloved vegetables. I could never quite look at lettuce (Lactuca spp. ; Asteraceae) the same way again after reading that it was a symbol of male virility and considered an aphrodisiac by ancient Egyptians. I still love lettuce, but I strongly prefer not to think of it in the same way the pharaohs did. The history and the marketing makes maca seem like something elevated above our more pedestrian cruciferous starchy structures, but I wondered if there’s real plant biology behind the maca hype. So I dug into the literature on maca composition. My initial hypothesis before digging into the literature was that maca might have elevated quantities of putatively beneficial glucosinolate defense compounds because wild plants (or nearly wild cultivated plants) are almost always packed with more anti-pest capacity than their domesticated relatives (read about some patterns in glucosinolate defense chemistry in my caterpillar herbivory post). This turns out to be the case. Maca has a distinctive crucifer aroma and flavor, due to its nine glucosinolates, which collectively take up about 1% of dry mass. This is around 100 times more than the concentration of glucosinolates in some cruciferous crops for which we use the aboveground portions (cabbage, cauliflower, and broccoli; (Wang et al. 2007). I don’t know about glucosinolate concentrations in belowground storage structures in turnip, radish and rutabaga, but they might be closer to the high concentration in the maca hypocotyl than the concentration is in cabbage, because the maca hypocotyl has higher glucosinolate concentrations than maca leaves do (Wang et al. 2007). Some of the glucosinolates in maca are not present in other cultivated crucifers (Dini, Tenore & Dini 2002). Maca also has several putatively unique alkaloids and phytosterols that may be pharmacologically significant (Wang et al. 2007). The phytosterols serve physiological roles in the plant, especially in cell membranes. The alkaloids are probably defense compounds, and at least one of them is a compound that inhibits the enzyme monoamineoxidase. Similar monoamineoxidase inhibitor (MOAI) compounds are prescribed as drugs to treat depression and Parkinson’s disease. I don’t know what MOAIs do for plants besides a possible defense role, but their presence in plants like chocolate and maca may contribute to cravings for these foods (Sonia Piacente et al. 2002; Wang et al. 2007). Also putatively unique to maca is the polyunsaturated fat macaene and its derivative macamide. Some folks think these may be the pharmacologically active constituents responsible for the aphrodisiac reputation (Wang et al. 2007). I say “putatively unique” because maca chemistry has been studied extensively, but similar pharmaceutical investigation has been neglected on maca’s legion close relatives, many of whom are closer to maca genetically than radish or turnip. The major hypothesis of comparative biology is that close relatives are more similar to each other than they are to distant relatives. Sometimes an organism achieves evolutionary innovation that outpaces its closet brethren in some regard. Such may be the case with maca, but there is precious little rigorous evaluation of whether or not it’s the case. Some of maca’s closest relatives are cosmopolitan weeds that are far easier to grow and access than maca, but I couldn’t find evidence of a comprehensive chemical analysis of these as has been done for maca. Taking this comparative approach seems like fairly low-hanging fruit, or hypocotyl or leaf or seed, as the case may be, for herbal medicine and pharmaceutical entrepreneurs. Radish varieties: white, black, watermelon and China rose. Pretty, but probably not like maca. Maca is only one of around two hundred species in the genus Lepidium, one of the few plant genera to have species native to all continents except Antarctica (Mummenhoff, Brüggemann & Bowman 2001; Zhang et al. 2016). The genus originated in the Mediterranean, center of diversity of many cruciferous genera, including Brassica oleracea, and spread from there, mostly be long-distance dispersal (Zhang et al. 2016). Lepidium sativum is known as garden cress and is commercially cultivated as a salad green in western Europe (I might add some to my Johnny’s Seeds order). Several Lepidium species have become edible cosmopolitan weeds (for example, L. virginicum, L. campestre, L. draba, L. latifolium). As far as I can tell, extensive pharmacological analysis and trials have only been performed on L. sativum, the cultivated species, and there is evidence of aphrodisiac use of that species (Khaleghi Ghadiri & Gorji 2004). Beyond Lepidium species, some other cruciferous vegetables do have a historical record as aphrodisiacs. Ethnographies of traditional food use in the Mediterranean region indicates that several wild cruciferous plants there, including watercress (Nasturtium officinale) and arugula or rocket (Eruca sativa and Diplotaxis tenuifolia), are considered to promote myriad aspects of health, including acting as aphrodisiacs (Yaniv, Schafferman & Amar 1998; Guarrera & Savo 2013). Arugula was a sacred plant of Greek fertility god Priapus and was considered by Romans to be a powerful remedy against impotence (Pignone & Gómez-Campo 2011). Horseradish, too, has long been considered aphrodisiac (Agneta, Möllers & Rivelli 2013). Alas, I found nothing on turnips or radishes. Genomically, maca actually is special. Its evolution includes two whole genome duplication events (Mummenhoff et al. 2001; Zhang et al. 2016). Its ancestral Lepidium species from the Mediterranean is diploid (its genome has two chromosome copies, like ours), and Maca’s genome has eight chromosome copies. Genome duplications happen because of mistakes during meiosis, when gametes are produced before copied chromosomes are split. Following a genome copy event, genes that produce things like pharmacologically active compounds become somewhat evolutionarily labile and may end up creating innovative compounds (Lynch & Conery 2000). Such appears to be the case with maca (Zhang et al. 2016). Genome duplication appears to be important in the radiation of Brassicaceae species into many habitats, including other alpine habitats around the globe (Karl & Koch 2013; Toräng et al. 2015). There is some evidence that evolution in the doubled chromosomes helped the ancestral maca adapt to the high Andes (Zhang et al. 2016), and these changes might contribute to their pharmacological activity, although that has not been investigated explicitly yet. There may very well be a similar link between genome evolution, high elevation adaptation, and pharmacological compounds in other high-elevation crucifers, too, but we don’t know. The ethnopharmacology and relevant chemical analysis, however, of other high-elevation crucifers has not been done, as far as I can tell. All crucifers produce one or more glucosinolates, and many produce the types of phytosterols, alkaloids, and polyunsaturated fats (like canola oil, from Brassica species) that may be pharmacologically significant in maca. Brassicaceae is a huge plant family, and there is obviously a tremendous amount of potentially useful comparative chemistry to be done on it. Spanish explorers brought American food plants back to Europe in the second half of the sixteenth century, including the Andean staple potato (Solanum tuberosum). They overlooked other important Andean crops, including quinoa and maca. I wonder why that is, especially since Spanish explorers were likely already familiar with domesticated cruciferous crops from Europe (see our Brassicaceae diversity post). It’s a shame, really. It was a tumultuous time. They could have used a little more love. Agneta, R., Möllers, C. & Rivelli, A.R. (2013) Horseradish (Armoracia rusticana), a neglected medical and condiment species with a relevant glucosinolate profile: a review. Genetic Resources and Crop Evolution, 60, 1923–1943. Balick, M. & Lee, R. 2002. Lessons from the field: Maca: From traditional food crop to energy and libido stimulant. Alternative therapies in health and medicine 8.2: 96-98. Dini, I., Tenore, G.C. & Dini, A. (2002) Glucosinolates from Maca (Lepidium meyenii). Biochemical Systematics and Ecology, 30, 1087–1090. Etkin, N.L. (Nina L. (2006) Edible Medicines : An Ethnopharmacology of Food. University of Arizona Press. Guarrera, P.M. & Savo, V. (2013) Perceived health properties of wild and cultivated food plants in local and popular traditions of Italy: A review. Journal of Ethnopharmacology, 146, 659–680. Johns, T. (1996) The Origins of Human Diet and Medicine : Chemical Ecology. University of Arizona Press. Karl, R. & Koch, M.A. (2013) A world-wide perspective on crucifer speciation and evolution: phylogenetics, biogeography and trait evolution in tribe Arabideae. Annals of Botany, 112, 983–1001. Khaleghi Ghadiri, M. & Gorji, A. (2004) Natural remedies for impotence in medieval Persia. International Journal of Impotence Research, 16, 80–83. Leonti, M. (2012) The co-evolutionary perspective of the food-medicine continuum and wild gathered and cultivated vegetables. Genetic Resources and Crop Evolution, 59, 1295–1302. Lynch, M. & Conery, J.S. (2000) The Evolutionary Fate and Consequences of Duplicate Genes. Science, 290. Mummenhoff, K., Brüggemann, H. & Bowman, J.L. (2001) Chloroplast DNA phylogeny and biogeography of Lepidium (Brassicaceae). American journal of botany, 88, 2051–63. Pignone, D. & Gómez-Campo, C. (2011) Eruca. Wild Crop Relatives: Genomic and Breeding Resources, pp. 149–160. Springer Berlin Heidelberg, Berlin, Heidelberg. Sonia Piacente, †, Virginia Carbone, ‡, Alberto Plaza, †, Aurelia Zampelli, † and & Cosimo Pizza*, †. (2002) Investigation of the Tuber Constituents of Maca (Lepidium meyenii Walp.). Toräng, P., Wunder, J., Obeso, J.R., Herzog, M., Coupland, G. & Ågren, J. (2015) Large-scale adaptive differentiation in the alpine perennial herb Arabis alpina. New Phytologist, 206, 459–470. Totelin, L. (2015) When foods become remedies in ancient Greece: The curious case of garlic and other substances. Journal of Ethnopharmacology, 167, 30–37. Valussi, M. & Scirè, A.S. (2012) Quantitative ethnobotany and traditional functional foods. Nutrafoods, 11, 85–93. Wang, Y., Wang, Y., McNeil, B. & Harvey, L.M. (2007) Maca: An Andean crop with multi-pharmacological functions. Food Research International, 40, 783–792. Yaniv, Z., Schafferman, D. & Amar, Z. (1998) Tradition, uses and Biodiversity of rocket (Eruca Sativa, Brassicaceae) in Israel. Economic Botany, 52, 394–400. Zhang, J., Tian, Y., Yan, L., Zhang, G., Wang, X., Zeng, Y., Zhang, J., Ma, X., Tan, Y., Long, N., Wang, Y., Ma, Y., He, Y., Xue, Y., Hao, S., Yang, S., Wang, W., Zhang, L., Dong, Y., Chen, W. & Sheng, J. (2016) Genome of Plant Maca (Lepidium meyenii) Illuminates Genomic Basis for High-Altitude Adaptation in the Central Andes. Molecular Plant, 9, 1066–1077. This entry was posted in The basics, Uncategorized, Vegetables and tagged aphrodisiac, Brassicaceae, Jeanne L. D. Osnas, Lepidium, maca. Bookmark the permalink.